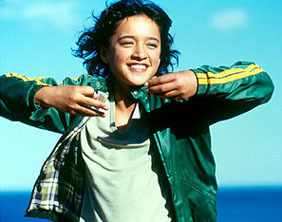 Half-Maori, half-Australian, and raised in New Zealand, Keisha Castle-Hughes was eleven years old and had no previous acting experience -- not even a school play -- when she was cast in the feminist fable Whale Rider. To beat out 10,000 other girls who wanted the part, she lied that she was a good swimmer, and ended up taking swim lessons while the movie was being filmed. For her performance she became the youngest-ever Oscar nominee for Best Actress, but the award that year went to Charlize Theron for Monster. She starred in the video for Prince's "Cinnamon Girl", playing an Arab-American who considers becoming a suicide bomber in the aftermath of 9/11. In the final Star Wars film, she played Apailana, the former Princess of Theed who became Queen upon Padme's death. In 2006, she played the Virgin Mary in The Nativity Story, but the 16-year-old star was not invited to the film's premiere at the Vatican after announcing her pregnancy with her longtime boyfriend, 19-year-old Bradley Hull. Her parents never married and are no longer together. Castle-Hughes became a naturalized citizen of New Zealand in 2001, which by law revoked her Australian citizenship. Her younger brother, Rhys Castle-Hughes, plays a shipwrecked slave child on the New Zealand TV show The Lost Children.